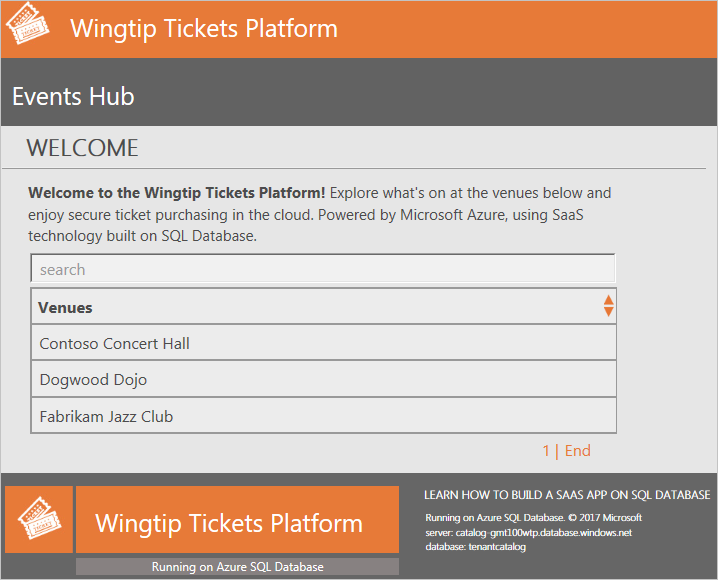 In this tutorial, you deploy and explore the Wingtip Tickets SaaS database-per-tenant application (Wingtip). The app uses a database-per-tenant pattern to store the data of multiple tenants. 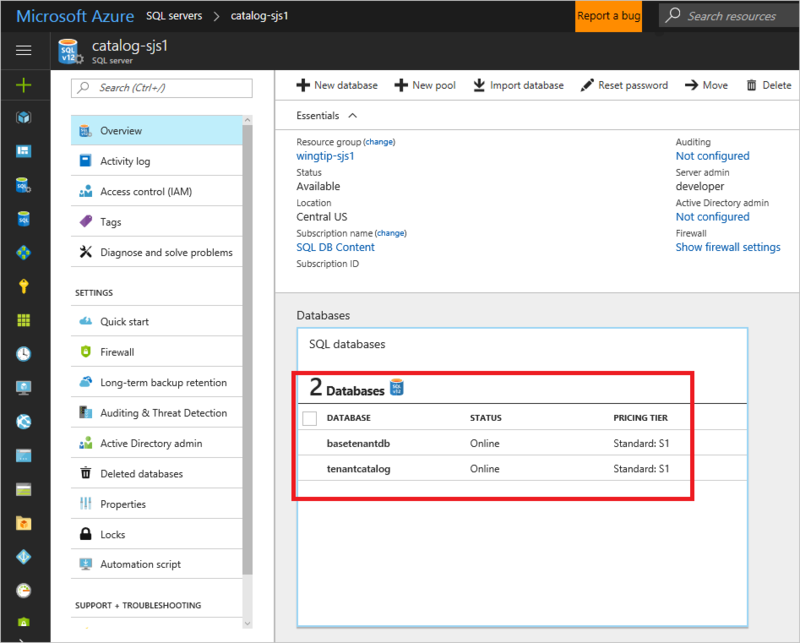 The app is designed to showcase features of Azure SQL Database that simplify how to enable SaaS scenarios. Five minutes after you select Deploy to Azure, you have a multitenant SaaS application. The app includes a SQL database that runs in the cloud. The app is deployed with three sample tenants, each with its own database. All the databases are deployed into a SQL elastic pool. The app is deployed to your Azure subscription. You have full access to explore and work with the individual components of the app. The application C# source code and the management scripts are available in the WingtipTicketsSaaS-DbPerTenant GitHub repo. How to deploy the Wingtip SaaS application. Where to get the application source code and management scripts. About the servers, pools, and databases that make up the app. How tenants are mapped to their data with the catalog. How to provision a new tenant. How to monitor tenant activity in the app. A series of related tutorials offers to explore various SaaS design and management patterns. The tutorials build beyond this initial deployment. When you use the tutorials, you can examine the provided scripts to see how the different SaaS patterns are implemented. The scripts demonstrate how features of SQL Database simplify the development of SaaS applications. To complete this tutorial, make sure Azure PowerShell is installed. For more information, see Get started with Azure PowerShell. User: af1 is made up of Ann Finley's initials plus a digit. If you deploy the app a second time, use a different value. An example is af2. Resource group: wingtip-dpt-af1 indicates this is the database-per-tenant app. Append the user name af1 to correlate the resource group name with the names of the resources it contains. Choose your names now, and write them down. To open the Wingtip Tickets SaaS database-per-tenant deployment template in the Azure portal, select Deploy to Azure. Enter values in the template for the required parameters. Some authentication and server firewalls are intentionally unsecured for demonstration purposes. We recommend that you create a new resource group. Don't use existing resource groups, servers, or pools. Don't use this application, scripts, or any deployed resources for production. Delete this resource group when you're finished with the application to stop related billing. Resource group: Select Create new, and provide the unique name you chose earlier for the resource group. Location: Select a location from the drop-down list. User: Use the user name value you chose earlier. a. Select to agree to the terms and conditions. To monitor deployment status, select Notifications (the bell icon to the right of the search box). Deploying the Wingtip Tickets SaaS app takes approximately five minutes. While the application deploys, download the source code and management scripts. Executable contents (scripts and DLLs) might be blocked by Windows when .zip files are downloaded from an external source and extracted. Follow the steps to unblock the .zip file before you extract the scripts. Unblocking makes sure the scripts are allowed to run. Browse to the WingtipTicketsSaaS-DbPerTenant GitHub repo. Select Download ZIP, and then save the file. Right-click the WingtipTicketsSaaS-DbPerTenant-master.zip file, and then select Properties. On the General tab, select Unblock > Apply. Scripts are located in the ...\WingtipTicketsSaaS-DbPerTenant-master\Learning Modules folder. Before you run any scripts, update the resource group and user values in the User Config file. Set these variables to the values you used during deployment. Update ResourceGroupName and Name with the specific values for your deployment (on lines 10 and 11 only). These values are referenced in nearly every script. The app showcases venues that host events. Venue types include concert halls, jazz clubs, and sports clubs. In Wingtip Tickets, venues are registered as tenants. Being a tenant gives a venue an easy way to list events and to sell tickets to their customers. Each venue gets a personalized website to list their events and to sell tickets. Internally in the app, each tenant gets a SQL database deployed into a SQL elastic pool. A central Events Hub page provides a list of links to the tenants in your deployment. Use the URL to open the Events Hub in your web browser: http://events.wingtip-dpt.<user>.trafficmanager.net. Substitute <user> with your deployment's user value. 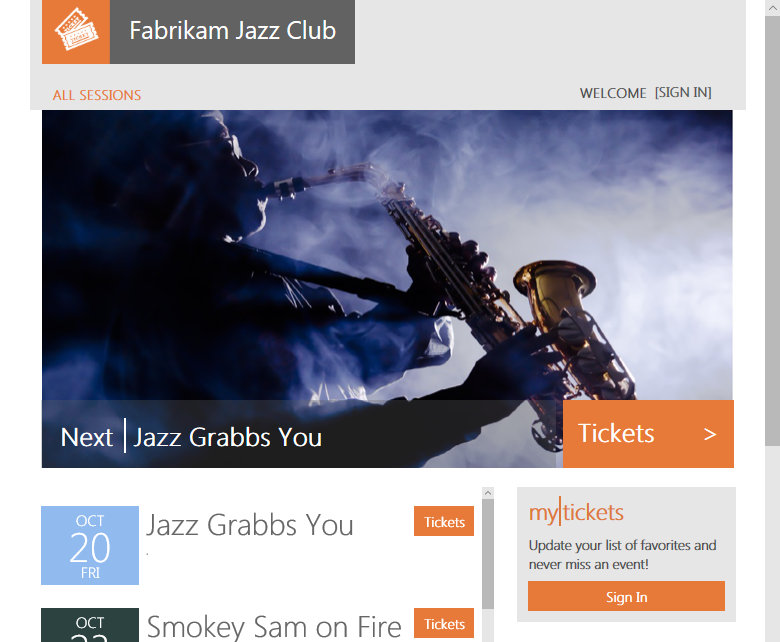 Select Fabrikam Jazz Club in the Events Hub. The parts of the preceding format are explained in the following table. http://events.wingtip-dpt The events parts of the Wingtip app. -dpt distinguishes the database-per-tenant implementation of Wingtip Tickets from other implementations. Examples are the single app-per-tenant (-sa) or multitenant database (-mt) implementations. .<user> af1 in the example. .trafficmanager.net/ Traffic Manager, base URL. fabrikamjazzclub Identifies the tenant named Fabrikam Jazz Club. The tenant name is parsed from the URL by the events app. The tenant name is used to create a key. The key is used to access the catalog to obtain the location of the tenant's database. The catalog is implemented by using shard map management. The Events Hub uses extended metadata in the catalog to construct the list-of-events page URLs for each tenant. In a production environment, typically you create a CNAME DNS record to point a company internet domain to the Traffic Manager DNS name. It may not be immediately obvious what the use of the traffic manager is in this tutorial. The goal of this series of tutorials is to showcase patterns that can handle the scale of a complex production environment. In such a case, for example, you would have multiple web apps distributed across the globe, co-located with databases and you would need traffic manager to route between these instances. Another set of tutorials that illustrates the use of traffic manager though are the geo-restore and the geo-replication tutorials. In these tutorials, traffic manager is used to help to switch over to a recovery instance of the SaaS app in the event of a regional outage. Now that the app is deployed, let's put it to work. The Demo-LoadGenerator PowerShell script starts a workload that runs against all tenant databases. The real-world load on many SaaS apps is sporadic and unpredictable. To simulate this type of load, the generator produces a load with randomized spikes or bursts of activity on each tenant. The bursts occur at randomized intervals. It takes several minutes for the load pattern to emerge. Let the generator run for at least three or four minutes before you monitor the load. In the PowerShell ISE, open the ...\Learning Modules\Utilities\Demo-LoadGenerator.ps1 script. Press F5 to run the script and start the load generator. Leave the default parameter values for now. Sign in to your Azure account, and select the subscription you want to use, if necessary. The load generator script starts a background job for each database in the catalog and then stops. If you rerun the load generator script, it stops any background jobs that are running before it starts new ones. Demo-LoadGenerator.ps1 starts LoadGenerator.ps1 in the foreground. Both .ps1 files are stored under the folders Learning Modules\Utilities\. LoadGenerator.ps1 loops through all tenant databases in the catalog. By default, the background jobs run for 120 minutes. Each job causes a CPU-based load on one tenant database by executing sp_CpuLoadGenerator. The intensity and duration of the load varies depending on $DemoScenario. sp_CpuLoadGenerator loops around a SQL SELECT statement that causes a high CPU load. The time interval between issues of the SELECT varies according to parameter values to create a controllable CPU load. Load levels and intervals are randomized to simulate more realistic loads. This .sql file is stored under WingtipTenantDB\dbo\StoredProcedures\. If $OneTime = $false, the load generator starts the background jobs and then continues to run. Every 10 seconds, it monitors for any new tenants that are provisioned. If you set $OneTime = $true, the LoadGenerator starts the background jobs and then stops running in the foreground. For this tutorial, leave $OneTime = $false. Use Ctrl-C or Stop Operation Ctrl-Break if you want to stop or restart the load generator. If you leave the load generator running in the foreground, use another PowerShell ISE instance to run other PowerShell scripts. Before you continue with the next section, leave the load generator running in the job-invoking state. The initial deployment creates three sample tenants. Now you create another tenant to see the impact on the deployed application. In the Wingtip app, the workflow to provision new tenants is explained in the Provision and catalog tutorial. In this phase, you create a new tenant, which takes less than one minute. Open a new PowerShell ISE. Open ...\Learning Modules\Provision and Catalog\Demo-ProvisionAndCatalog.ps1. To run the script, press F5. Leave the default values for now. Many Wingtip SaaS scripts use $PSScriptRoot to browse folders to call functions in other scripts. This variable is evaluated only when the full script is executed by pressing F5. Highlighting and running a selection with F8 can result in errors. To run the scripts, press F5. Created in an SQL elastic pool. After successful provisioning, the Events site of the new tenant appears in your browser. Refresh the Events Hub to make the new tenant appear in the list. Now that you've started running a load against the collection of tenants, let's look at some of the resources that were deployed. 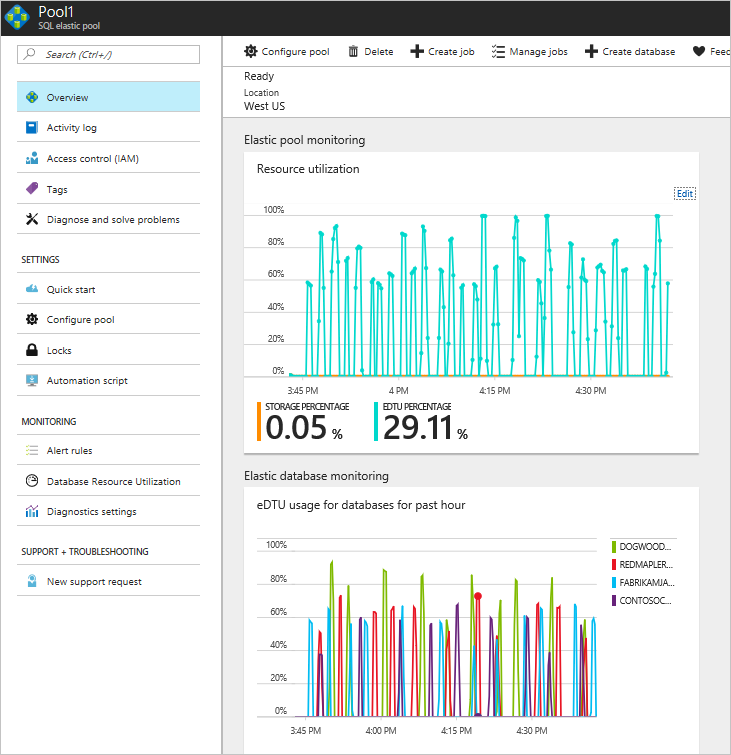 In the Azure portal, browse to your list of SQL servers. Then open the catalog-dpt-<USER> server. The catalog server contains two databases, tenantcatalog and basetenantdb (a template database that's copied to create new tenants). Go back to your list of SQL servers. Open the tenants1-dpt-<USER> server that holds the tenant databases. Each tenant database is an Elastic Standard database in a 50-eDTU standard pool. 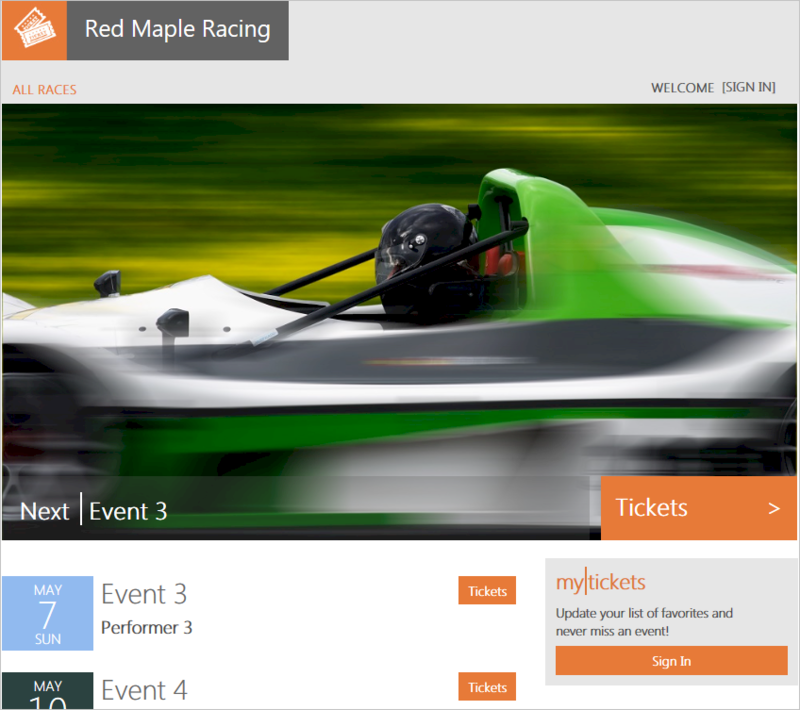 The Red Maple Racing database is the tenant database you provisioned previously. After LoadGenerator.ps1 runs for several minutes, enough data should be available to start looking at some monitoring capabilities. These capabilities are built into pools and databases. Browse to the server tenants1-dpt-<user>, and select Pool1 to view resource utilization for the pool. In the following charts, the load generator ran for one hour. The first chart, labeled Resource utilization, shows pool eDTU utilization. The second chart shows eDTU utilization of the five most active databases in the pool. The two charts illustrate that elastic pools and SQL Database are well suited to unpredictable SaaS application workloads. The charts show that four databases are each bursting to as much as 40 eDTUs, and yet all the databases are comfortably supported by a 50-eDTU pool. The 50-eDTU pool can support even heavier workloads. If the databases are provisioned as single databases, each one needs to be an S2 (50 DTU) to support the bursts. The cost of four single S2 databases is nearly three times the price of the pool. In real-world situations, SQL Database customers run up to 500 databases in 200 eDTU pools. For more information, see the Performance monitoring tutorial. For more information, see additional tutorials that build on the Wingtip Tickets SaaS database-per-tenant application. 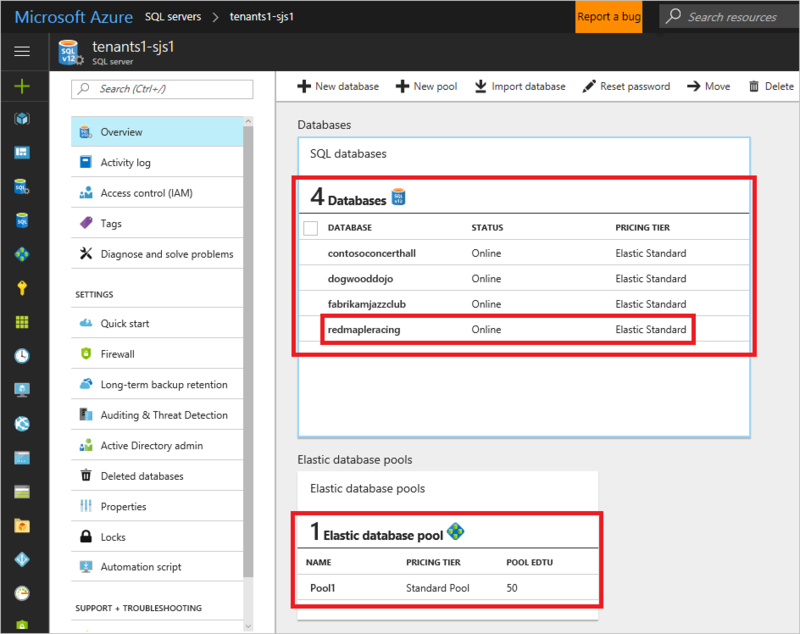 To learn about elastic pools, see What is an Azure SQL elastic pool?. To learn about elastic jobs, see Manage scaled-out cloud databases. To learn about multitenant SaaS applications, see Design patterns for multitenant SaaS applications. How to deploy the Wingtip Tickets SaaS application. How to provision new tenants. How to view pool utilization to monitor tenant activity. How to delete sample resources to stop related billing. Next, try the Provision and catalog tutorial.